Layers can be rearranged to bring them closer to the front or back in relation to the other layers in a panel. 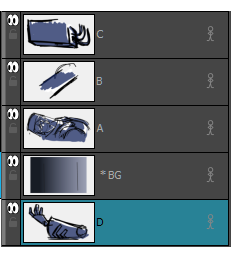 For example, if you want to have a character move to the front of a shot, you can move the character layer above the others. 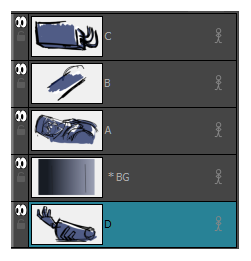 In Storyboard Pro, the layers at the top of the list are displayed above the other layers in the Stage view. 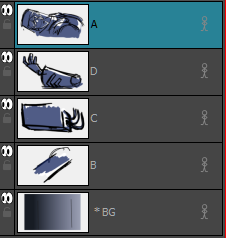 The layer order will be reflected in the final export. 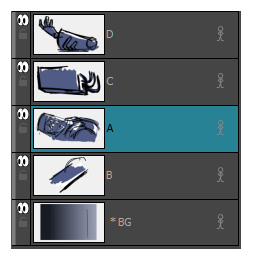 There are several different ways to change the order of layers in a panel. You can reorder layers by selecting a layer and dragging it to a new location, or reorder layers through the Layers menu. Select a layer to move. Drag the layer above or below other layers to change their display priority in the Stage view. Select a layer to modify. 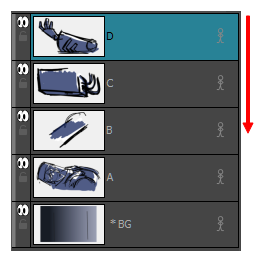 ‣ Layer > Arrange > Bring Layer to Front to move the selected layer in front of all other layers in the current panel. 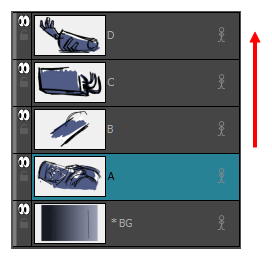 ‣ Layer > Arrange > Bring Layer to Forward to move the selected layer up one spot in the current panel. ‣ Layer > Arrange > Send Layer to Back to move the selected behind all other layers in the current panel. ‣ Layer > Arrange > Bring Layer Backward to move the selected layer down one spot in the current panel. NOTE: If you changed the Z-depth, it supecedes the layer order.